If you’re thinking soup is just a winter food, you’re wrong. 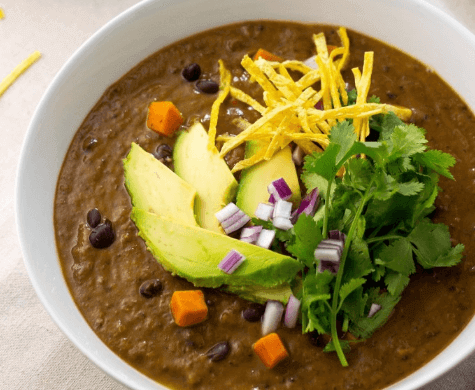 This Vegan Sweet Potato with Black Bean Soup is something you can enjoy all year round. This flavorful easy vegetarian meal will hit the spot. It’s tasty and because it’s vegan food you know good for you. It is also a cheap way to get protein into your diet. Sweet potatoes are fast becoming popular as a main ingredient for a variety of dishes. It’s wholesome and full of health benefits. This veggie is dominating bake and fried recipes. And now even soup recipes! It’s one of the more perfect vegan foods. Soups are warm and soothing vegan recipes that can make anyone feel better. With ingredients you already have in the kitchen, and eliminating animal products, you can make a stunning vegan soup that is so much better. This is a kind of recipe that will tickle your taste buds. This plant based soup is so delicious you will make it more than once. The thick, creamy taste it possesses comes from peeled and diced sweet potatoes, cooked black beans, cumin, olive oil, and vegetable stock. 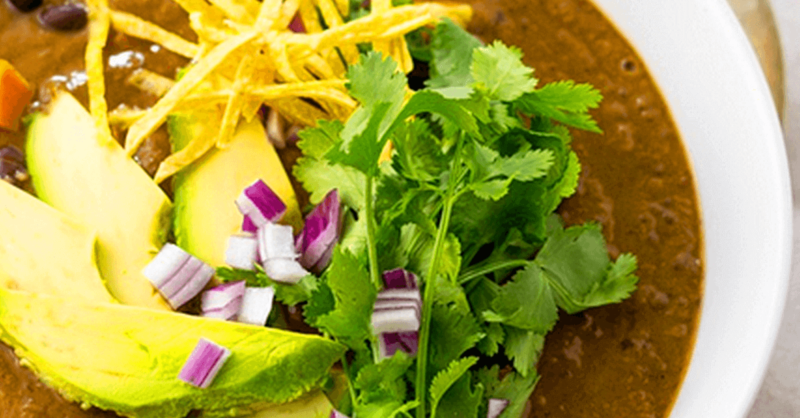 In this recipe some red onion, cilantro, and avocado, are also creatively used for garnish. But the real superstar of this hearty soup which adds the smokey flavor is the paprika. Are you read to make this incredible vegan soup recipes? Get the recipe for Vegan Sweet Potato with Black Bean Soup on the next page below.